Butterflied and stuffed, this delicious Grilled Pork Roast with Rosemary and Garlic makes a wonderful roast for a weeknight meal or dinner party. Did I mention that I love summer?! Since the days are longer, I’m finding every excuse to grill outside. The kids get to play, mom and dad get to relax and the whole family can enjoy a delicious meal. One of my favorite cuts of meat is the pork loin. 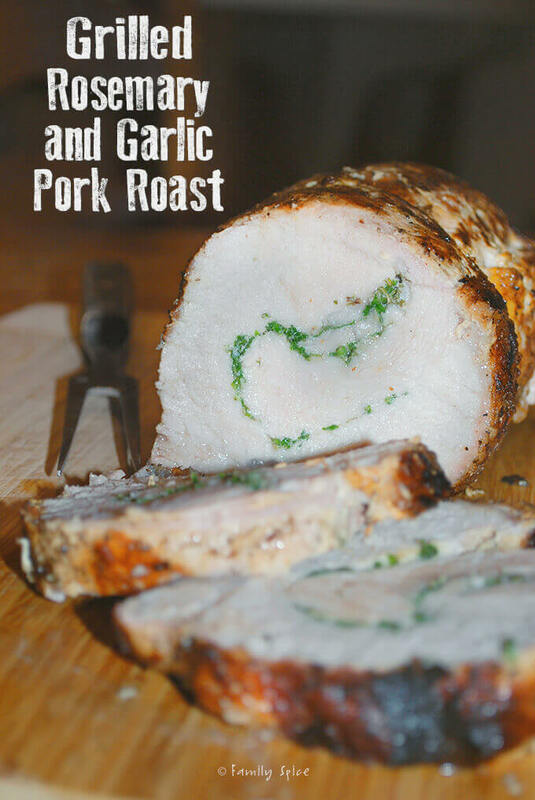 It is larger than the pork tenderloin cut, but just as tender, moist and delicious. It is also a cheaper cut of meat compared to the tenderloin, which makes it perfect for my wallet and for feeding my family of five. Since I like to use the pork loin, I usually purchase the large 8-pound pork loin from Costco then cut it in thirds. 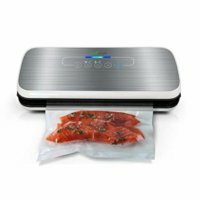 If I am not using the meat right away, I then vacuum seal each roast and freeze them individually. For this recipe, I am using one of the roasts which is now about 2 1/2 pounds in size. To butterfly this pork loin, place roast fat-side up on cutting board. Starting about 1-inch up from cutting board, cut horizontally, stopping about 1/2 inch before the edge. Now, cut into thicker half of roast, again, starting about 1 inch from cutting board and stopping about 1/2 inch before edge. You are basically slicing your roast but not all the way and pulling up and opening the roast like a page of a book. It sounds more complicated than it is, trust me. Once your pork roast is open and one flat piece of meat, approximately 1/4-1/2 inch thick, you can layer in the garlic and rosemary stuffing. You can use almost any kind of stuffing for your pork loin roast. Now you can see why I love preparing this dish? The flavor options are limitless: chimichurri, pesto, cranberry sauce, marinara. 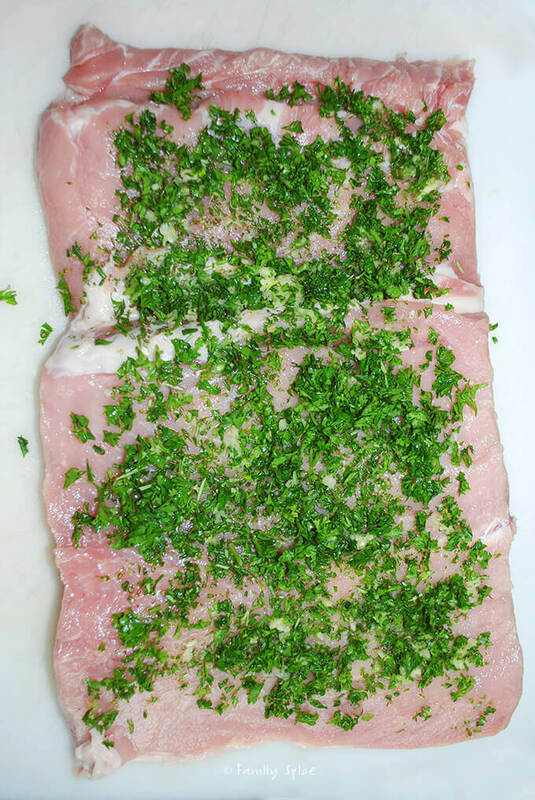 I have a fabulous recipe for an Italian Pork Roast where I layer in proscuitto and basil pesto. 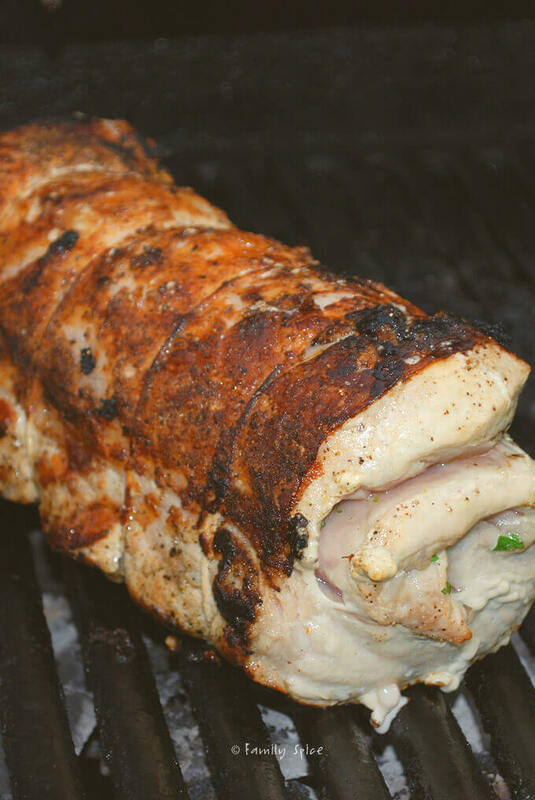 For this grilled pork roast, I minced rosemary, parsley, garlic and olive oil and spread it inside. Oh the smell of fresh herbs and garlic! 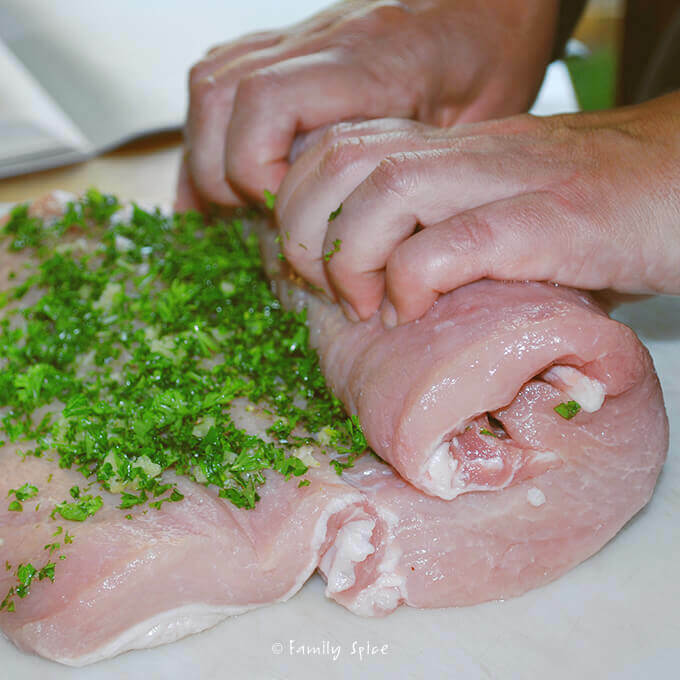 Once everything is spread over your pork roast, roll it up and tie it kitchen twine. When your roast is cooked and you cut into it, you will find this beautiful herbal swirl inside the roast! The key to moist and juicy pork, especially on the grill, is to sear the meat to seal in the juices. 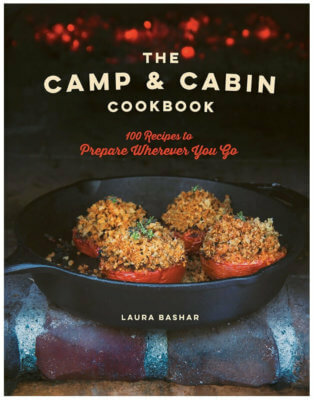 Because you are grilling a 2 1/2 pound roast, you want your roast to be browned and caramelized on the outside, but moist and cooked thoroughly on the inside. After the roast is browned, you reduce the heat on the grill and cook the roast slowly until the internal temperature is 140º, about 35 minutes. Just like all meats, you should let it rest for 10 minutes, keeping it tented as the temperature inside reaches a safe 145ºF. Butterflied and stuffed, this delicious Grilled Pork Roast with Rosemary and Garlic makes a wonderful roast for a weeknight meal or dinner party. Recipe adapted from Cook's Country, June/July 2009. 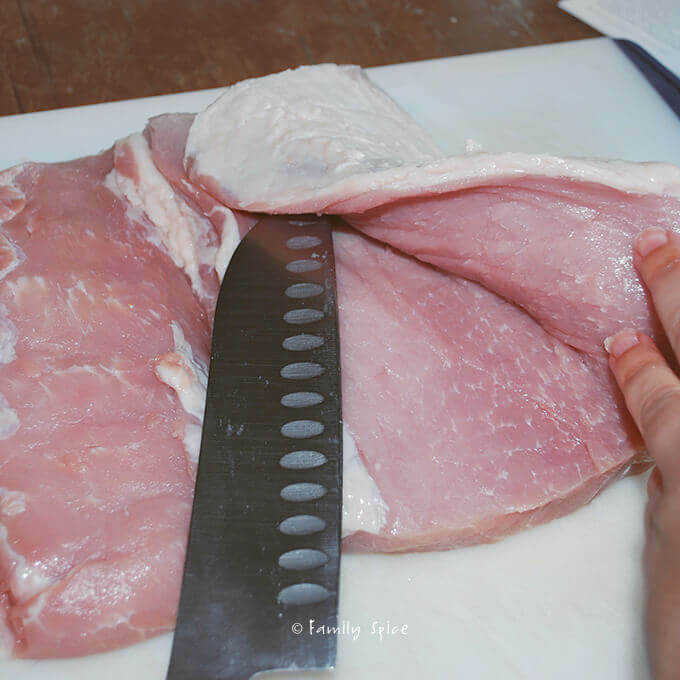 Using a knife, lightly score the fat on top of pork loin. In a small bowl, combine herbs, garlic, 1/2 tsp salt, 1/4 tsp black pepper and 2 TBS olive oil. To butterfly roast, place roast fat-side up on cutting board. Starting about 1 inch up from cutting board, cut horizontally, stopping about 1/2 inch before the edge. Now, cut into thicker half of roast, again, starting about 1 inch from cutting board and stopping about 1/2 inch before edge. Spread herb mixture evenly over surface of butterflied roast, leaving 1/2-inch border on all sides. Roll meat tightly and tie with kitchen twine at 1-2 inch intervals. 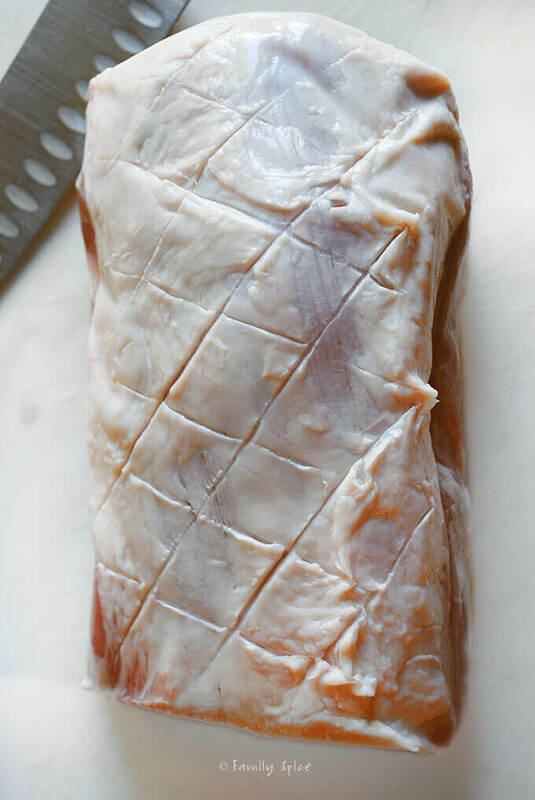 Roast can be wrapped tightly with plastic wrap and refrigerated for 24 hours if you are going to cook it later. Heat grill with all burners on high for 10 minutes, with lid closed. Scrape and oil cooking grate. Rub prepared roast all over with 1 TBS olive oil and season with 1/2 tsp salt and 1/4 tsp ground black pepper. Place roast on grill and grill until browned all over, about 12 minutes. 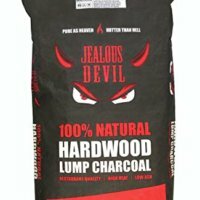 For charcoal grills, place roast directly over coals. 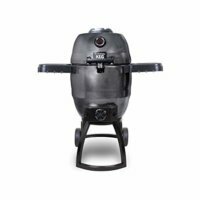 Leave primary burner on high and shut off other burner(s). and roast fat-side up on cooler side of the grill. Cook covered until meat thermometer internal temperature reads 140ºF, about 35 minutes. Transfer pork to cutting board, tent with foil, and let rest 15 minutes. Allow the pork's internal temperature to rise and reach 150ºF. Remove twine, slice and serve.